Months ago I started collecting old appliances and bits of junk for the boys to tinker with during the last weeks of MFW. I had envisioned many afternoons spent watching the boys take apart things and attempting to put them back together or combining them to come up with new things. They were so intrigued when we read Homer Price last year, the thought of a young boy building and fixing radios in his spare time was exciting for them. They wanted to do it too! I am thinking of expanding our junk collection and allowing them more time to tinker with things in the coming months. A copy of David Macauley’s “How Things Work,” a work table and some simple tools–thats pretty much the game plan. The boys made some crazy inventions out of legos too! As the sons of an engineer they take their building very seriously. It was great to hear them explain their creations and their reasoning as they detailed their choices made in style and structure and how it impacted the function of each invention. We’ll be celebrating our end of the year with a trip to Disney World and we will definitely be stopping at Epcot’s Innovations area. One machine the boys were not allowed to take apart (even though they begged to!) was my sewing machine. My second born started sewing a quiver for his archery set. He started out by hand stitching two inches of work, which took him awhile to get straight. Then I turned on the machine and the last 12 inches of seam were completed in seconds! “No wonder they called it IronWoman!” he exclaimed. Speaking of fantastic inventions, here is a great demonstration video of McCormick’s Reaper. The machine in the video is 174 years old! We played telephone around the house on telephone day. I also jumped on the chance to sneak in a little practical life skills lesson. We made sure to reinforce our important phone numbers in our memory banks and we practiced correct phone etiquette. We don’t have a house phone so this was an area I knew my children needed help in since they have never had to answer a phone before. It was great practice for them! Our Classical Conversations community announced that they would be holding a science fair and I was ecstatic to see that it coincided with our Inventors unit. The boys were able to select a topic that interested, ask questions, conduct research, keep a logbook, make a hypothesis, record materials needed, run through the procedure (with adult assistance) and then record conclusions and analysis. They employed the scientific method, which they use every week during their experiments at their Classical Conversations community. Our eldest chose to experiment with dew traps and investigated the process of obtaining water to sustain life in semi arid regions. Our second born built rotors and ran tests on a homemade wind turbine to determine how much weight it could lift. As you can see from the picture above, everyone showed up for the test runs! The boys decorated their project board and took their displays to the science fair. We loved getting to see all the other science experiments there. I highly recommend joining in on a science fair. Ask local private schools or county fair or community groups if they are willing to include homeschool projects and be sure to obtain their rules and procedures list. We’ve got the innovation bug over here now and I don’t doubt that the boys will be inventing all sorts of things in the coming weeks! Time for Pioneers on the Plains! We loved our book basket readings and the selection of stories from American Pioneers and Patriots. After we finished all our reading, we gathered round the table and talked about the remarkable timeline of pioneer life we have taken in this year. We made a list of all the greatest virtues and attributes these pioneers possessed and we made a lovely poster to hang in our class. The boys have been melancholy this week, knowing that Adventures is drawing to a close. They are quiet and working slowly through their last assignments. They asked to revisit some of our favorite Pioneer projects from earlier in the year and I agreed that they could each pick a few activities. We made homemade bread and butter. We packed a “pioneer picnic” and ate it outside under the trees. We played “Pioneers” in the backyard for at least an hour each day. With no girls around its tough to play Little House on the Prairie, but they have managed to create their own story line about the Ingalls prairie cousins the “Ingsons” <–see what they did there? “Luke”, “Mark” and “Carson” played on the prairie this week and had a ball. Necessity is the mother of invention. “In Grandma’s Attic” is a perfect way to end the year. We gathered some of our buttons in a jar and the boys have been playing with them as we read aloud. They make button animals or use the buttons to decorate play doh trees. They sort them by size and shape or by color. They ask questions about their own grandmothers and great grandmothers and I have spent many hours this week reading and retelling our own family stories. I found a fun looking basket at a thrift store a few months ago and I have decided to make it our button basket. I’ll be asking our relatives to send any fun buttons they don’t mind parting with for our basket. Its been such fun to play with and enjoy something small and simple while we tell and enjoy stories. Birds are suddenly back in full force! I loved comparing their bird drawings this week to the ones they produced earlier in the year. The Blue Jay and House Sparrow drawings were especially sweet this week. I always have the boys copy out a bit of the information from our Birds, Nests and Eggs book to accompany their drawing. We use spiral bound nature journals from Classical Conversations and they have held up nicely throughout the year. I love the little nature quote interspersed throughout. The boys have grown in remarkable ways this year. Their individual tastes are becoming more refined and specific. Their passions are starting to take shape. I am already starting to plan how I will help cultivate these interests in the coming year. We have spent the last two weeks learning about Abraham Lincoln and the Civil War. The boys picked up their Beautiful Feet Early American History Guide again and dove into Ingri D’Aulaire’s “Abraham Lincoln” which, like all D’Aulaire’s books, was a big hit with my kids. This book really brought Lincoln to life for them. Our conversations this week were centered around the importance of truthfulness, the discipline of hard work and the responsibility we have to stand up for justice. My eldest son (age 8) was able to memorize the Gettysburg address over the two week period. We would spend 5 minutes at a time reviewing and adding a new line. This would happen on the way to the grocery store or before bedtime or while we waited for his brother’s soccer practice to wrap up. It was really great to see him accomplish a lengthier piece of work. We spent so much time reading this week, desperately trying to catch up on the read alouds we missed while my throat was out of commission. I placed a large piece of kraft paper on the floor and the boys had their war plans laid out on it while I drank cup after cup of Throat Care and read. We did not make any fancy lap books or spend time with handouts. Other than a few coloring $1 coloring books from Dover on the various uniforms and weaponry of the Civil War, we mostly engaged with the battlefield below while listening to living book about the war. I also want to share one of our favorite productions from Audio Adventures: “With Lee in Virginia.” You can follow the link for information on the all star cast and how the production came together. We are huge G.A. Henty fans over here and I was over the moon when I discovered that Audio Adventures was producing so many of his stories. (We also have “Under Drake’s Flag”, “The Dragon and the Raven”, and “In Freedom’s Cause” all of which get an enthusiastic recommendation as well!) The boys were riveted by the story “With Lee in Virginia” and they listened to it several times over the past two weeks. Abraham Lincoln’s World by Genevieve Foster *** This is a great book to flip through and read bits out of but it is definitely out of age range (2nd-3rd) as a main study. But we loved looking through it! Abe loved books. We decided to really celebrate that this week and the boys spent a lot of time enjoying their favorite books over and over. We had our monthly “PoetTreats” tea time this week to make sure we celebrated our favorite poems too. “PoetTreats” is always a special time for us. I decorate our table nicely and make their favorite tea and treats. Everyone gets to bring their current favorite poetry book and we go around the table reading poems out loud while we enjoy our snacks. To cap off our study of Abraham Lincoln, my husband took the boys out to the wood pile where they learned how to chop and split wood. They were all so eager to lend a helping hand and learn from their Dad. The second week of the study was spent learning about slavery and the Civil War. We enjoyed learning about the first submarines of the Civil War and the kids came up with some really fun designs for old war machines! I brought out a reproduction newspaper from the civil war era and we discussed how differently news traveled back then and how soldiers communicated with various camps and the people back home. Each boy got to pen a pretend letter containing important battle plans for another civil war captain to read. Then they had to be delivered by another soldier through the woods to the campsite. Lets just say, I am still finding bits of paper and the occasional wood rifle in the backyard. It was a busy day! We have taken a few “Civil War” field trips in the last year and half. Knowing that we’d be diving into Adventures and eventually studying the war between the states, I made an effort during our road trips to stop off and show the boys bits of history. Over Christmas we stopped off at Gettysburg in Pennsylvania. Last April, my Mom and I took the boys to Fort Sumter. We learned a great deal at the museum and this week I asked the boys to recall some of what they had learned. They remembered many, many details from the fort and the museum inside. My eldest described in great detail, the flag pictured below, which is the original flag that was flying over Fort Sumter when it was attacked. My youngest remembered passing by the old Slave Mart (now a museum). Slavery is a hard topic to explain to children. We are proud to be Americans but we also want to acknowledge the very terrible things our country has been a part of. Racism is especially heartbreaking to explain when your children are completely innocent that such a thing exists. They first heard about it last year during our Cycle 3 study with Classical Conversations. I read them wonderful books starting with the civil war era up through the civil rights movement and they were left feeling very confused. They would ask about their African American/African friends and family members and wonder what it was that subjected them to these horrible things. I was feeling a little anxious about starting that painful topic all over this year. But this year, we had a few months of prior African History study in Cycle 1 of Classical Conversations. Hearing about the Songhai, Zanj and Zimbabweans, gave them a clearer picture of Africa and its history. We studied the start of the slave trade and its origins briefly to give them an idea of its full scope and long history. We did read several books about the lives of slaves on southern plantations and their experiences in the underground railroad, but the most helpful book we read was, “Who Owns the Sun?” by Stacey Chbosky. Now at first my son could not stop saying “God!” in answer to the question so I had to start over and preface it by saying, “Yes, God owns everything. But this book is asking if any one man owns the sun?” and this helped us move on with the book. By the last page there was not a dry eye around our table. I don’t think I will ever find an easy way to talk about slavery and/or racism, because it is a horrible and hard thing no matter how you approach it. Giving the boys a bit more background into the culture and discussing the topic of slavery in general, helped us understand the specifics of slavery in America a bit more clearly. Their tender hearts were pierced by this which was hard to watch but necessary for them to experience as they continue to grow in a world where racism is very much alive. We finished our time of study by praying to God and thanking Him for the life of Abraham Lincoln, who stood for up for justice and truth. We prayed for our country as we continue to be divided on issues of race. We prayed for our men in uniform overseas and here at home and for our leaders that govern our country. We always start planning the upcoming school year in January. This is partially due to our involvement with Classical Conversations. I have yet to blog much about CC, I’m still trying to get a solid year of MFW and HGP blogging under my belt before I try and add in CC. It is a huge part of our lives and our school year revolves around those 24 week cycles. Next year I will be directing a new Foundations community group in our area, which is exciting and nerve wracking all at once. Its strange to start planning so far in advance when I am still in the midst of this wonderful year I worked so hard to plan last January. But the time has come for the yearly, “State of the Union” and so this is the week when I stepped back and observed all that takes place in our home and in our hearts. For us, education is not simply what we are learning but who we are becoming. The short of it is, we are loving Adventures so far. It has been a perfect fit for our family and I am so grateful for it and for the Charlotte Mason method it employs. I am currently in the midst of reading “Consider This: Charlotte Mason and the Classical Tradition” by Karen Glass. It is one of the best homeschooling books I have ever read and I am savoring every single chapter. This book echoes all that we do (and hope to do) in our own home. Its wonderful to pick up a well written book that engages the two methods of education closest to my heart. This is what I have loved about Adventures. Not the amount my children are learning, though they have grown by leaps and bounds this year, but the virtue they are cultivating and employing. How much does he care? It seems everything we are studying, all the habit training and scripture study and living books, everything is nourishing these little ones to care, to desire to act rightly. Here is what the week looked like. We studied several states: Maine, Missouri, Arkansas and Michigan. The boys took great care in opening the tin of special colored pencils used for our States book. They were diligent in coloring each bird and flower to the right specifications. They copied down each state motto in their neatest penmanship. They closed their books and put away their pencils. They brought out the book basket and we went on adventures in four different states while the toddler shrieked in the background and the preschooler called for pretzels and juice. Everyone eventually settled down and we experienced beautiful illustrations and rich prose. The boys played with seashells while we read “Island Boy.” They acted out “Blueberries for Sal” and cooked pretend clam chowder after reading “One Morning in Maine.” We pulled out our Saxon books and halfway through our lesson, I noticed my six year old building cranes and seabirds out of pattern blocks. “Remember that story?” he asked, “About Obadiah and the seagull?” Off he went to fetch the book. As soon as he completed his math lesson, he picked up Brinton Turkle’s tender and lovely book, “Thy friend, Obadiah” and read it aloud to his siblings, giving special attention and affection to his younger brothers. Thirty minutes later we were on a website looking at the anatomy of birds and constructing their skeletal systems over and over again. This brought us back to our study of Human Anatomy. The boys brought down the Human Organ tray and began reading each three part card and matching them with the corresponding organs from their safari toob, until the toddler stole the large intestine and chaos ensued. We resolved the quarrel and moved on to our Usbourne Encyclopedia and the boys began to question the latin names they kept hearing, so we picked up our latin work and labored over a few declensions. One particular song used to memorize the 3rd declension latin noun endings reminded them of a Rachmaninoff piece they had heard weeks before. We listened to it twice and then one of the boys asked if we could play outside. We dashed out of the house and opened the coop to let the chickens out. Once again we were talking about birds and anatomy while the 5 year old zoomed by on skates humming Rachmaninoff and the 3 year old stomped around saying “Kuplink, Kuplank, Kuplunk,” in his best imitation of little Sal dropping blueberries in a tin pail. Week 23 was a slower week in terms of topics covered but it was a rich week nonetheless. On these slower weeks, I love to get out into nature with the boys. That prescheduled Friday nature walk is something I make sure to enforce. I make every effort to protect that part of their schedule. In many ways, it is the capstone to all we learn in the classroom. Our son’s godfather came to visit with his son and so our nature walk for Unit 23 took place at the beach. It was a nice tie in for all those “salty” books we read about Maine. The boys tumbled about the tide pools and played in the surf. They collected seashells and felt the sand between their toes. They experienced life and their souls were nourished by the sea air and warm water. Little scientific observations were sprinkled throughout the day. It happened naturally. “School” is not something they go to and then leave after a few hours. There are no compartmentalized subjects. It is not a chore. Learning is life and it brings them joy. Its our favorite time of year! “Winter.” The weather is gorgeous, though very rainy this year, and we spend more time than ever out of doors. The garden has gone absolutely berserk this year. I love walking outside and cutting a head of lettuce before dinner. We planted more veggies this week and I am looking forward to harvesting them in March. West by wagon train! The boys were eager to jump right in. I gave them each a small bag and asked them to pack things they would need for one week of travel through an unsettled, wild area. We had to pack and repack for over an hour. It was fun watching them try to figure out what really needed to go in the bag and what they could do without. 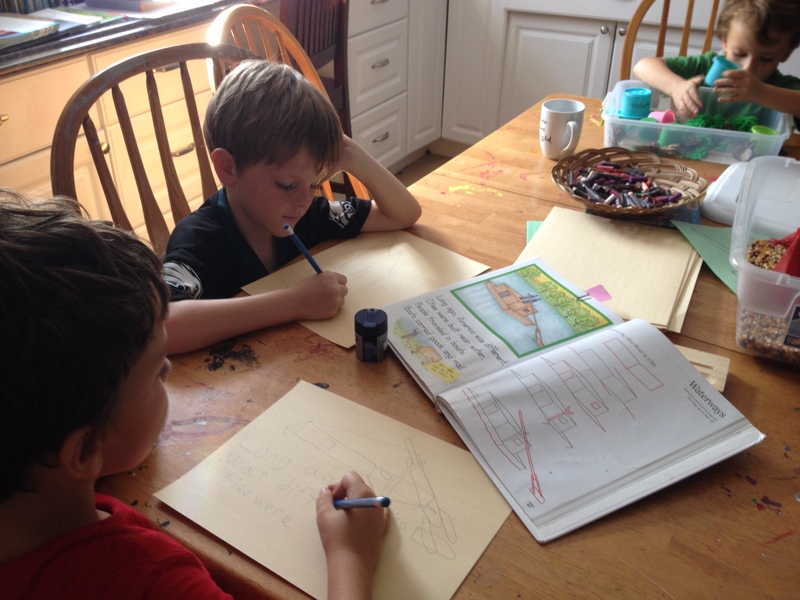 We read “Daily Life in a Covered Wagon” by Paul Erickson and the boys made their own “travel journals” as an exercise in creative writing. They wrote and illustrated stories about their make believe travels on the Oregon Trail. These entries read like the old Oregon Trail computer game I loved as a kid. Day 1: shot a buffalo. Day 2: dysentery. The illustrations were hilarious. I love when they ask to do their own projects. 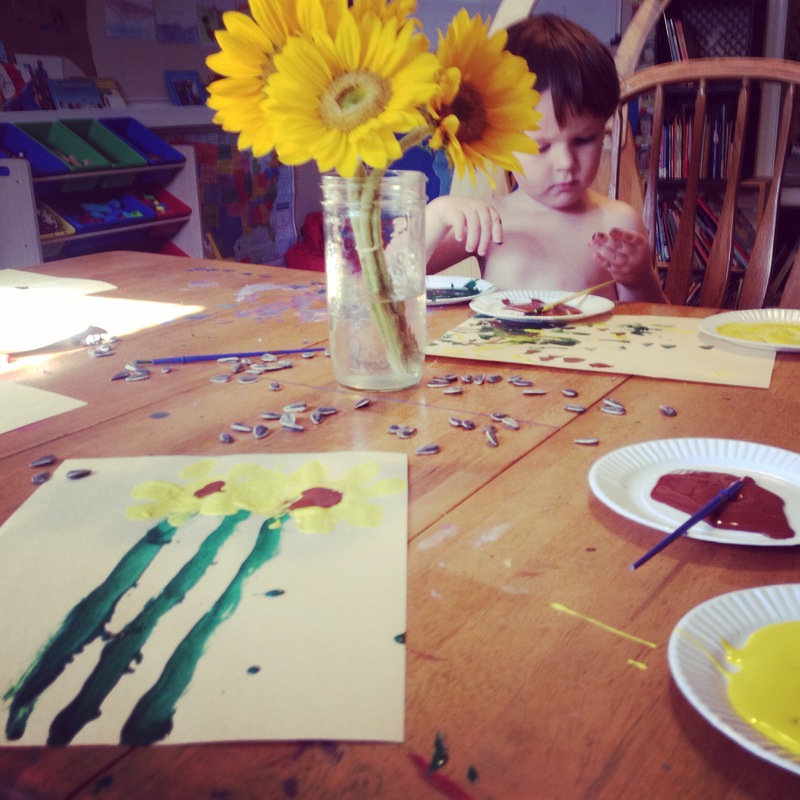 Its fun to watch their creativity bloom as they take complete control over their work. See that little model wagon? Looks nice in the picture doesn’t it? Its garbage. We could have burned three dollar bills in front of our children and they would have learned a greater lesson than the experience of putting this thing together. While we’ve had fun with other wood building kits, this one received poor marks. The quality is terrible and there is no building involved. You glue pieces together and watch the wheels fall off because the accompanying nails don’t fit correctly in the predrilled holes. a big thank you to my patient hubby for seeing that project through to the bitter end. After that disaster, we opted to use our play stand as a covered wagon. We threw a white sheet overtop and our eldest sang “Old Dan Tucker” as the kids pretended to bump along the trail. They ate lunch in their wagon and pretended to cook a few meals while I read aloud from their book basket. 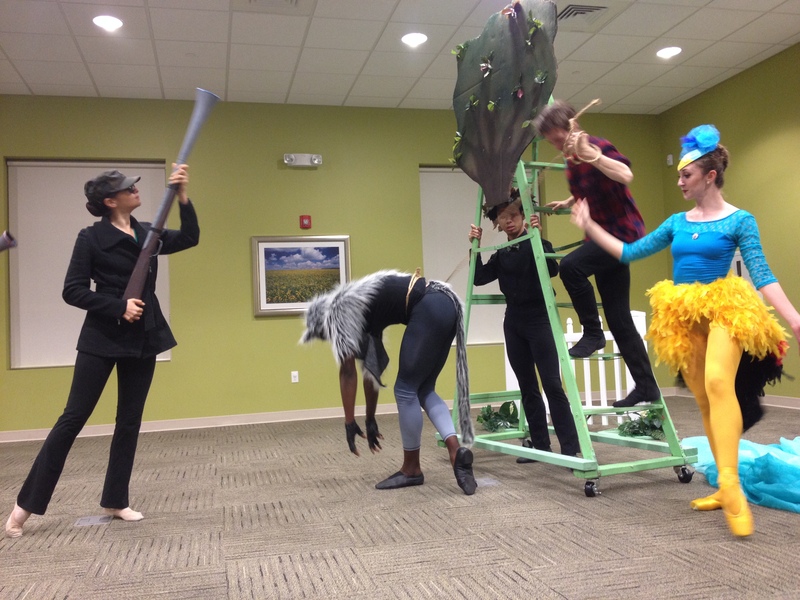 Then our youngest began crying for his play stand. “My birds! My blocks! My sky!” We put things to rights once more and he has not left it since. Territory claimed! We used the booklet, “My Body” last year during Cycle 3 of Classical Conversations. The boys each made a life size cut out of their body which they then filled in with various organ systems from the pages of this book. One book can be used for an entire family or classroom. This dover coloring book was an excellent choice for the boys. They have loved working in it and describing the various organs and systems to me as they complete each section. We picked up a Magic School Bus Human Anatomy science kit. The boys completed the majority of these experiments on their own and learned an incredible amount of information. This kit has inspired me to allow the boys to lead more of their own science projects. They are more than capable of gathering their own materials from around the house, following procedural steps, forming hypothesis and recording their results. I picked this kit up several months ago during a Zulily science sale. The school bus kits show up on Zulily frequently at a hefty discount. Other hands on activities we introduced and enjoyed included: puzzles, three part letter cards and a safari toob of human organs. This digestive system puzzle shows up in the Target dollar section every August. Our cross section Human Body Model from Learning Resources. I put together a human anatomy tray with three part cards for sorting and classifying. We used the Human Organs Safari Toob. The boys reached for this tray often throughout the week. Our little guys spent the majority of their time playing with Hape’s Layered Body Puzzle (male version). All our boys, ages 3-8 have used and enjoyed the Hape layer puzzle. It is currently the family favorite. Lastly, to reinforce right and left, our kids have been working with this Hands Counting puzzle from Melissa and Doug. We’ll be sharing more Anatomy projects in the days to come! I made several recordings of their young warmly voices as they sang out “The Star Spangled Banner.” Its difficult to imagine what they will sound like a few years from now. We recreated the Battle of Ft McHenry in our bathtub. We will not be sharing those pictures. Suffice to say, there was a great deal of water outside the tub when it was all said and done! We jumped in with our Interactive 3D American History maps. We looked up the various Indian tribes and geographical features mentioned on the map. The boys were very excited about researching these terms in their child craft encyclopedias. We made a lap book from Tina’s Dynamic Homeschool Plus. All the printouts were free and easy to assemble. We listed defining characteristics of various tribes, studied botany and mapped out Lewis and Clark’s route. We printed out the corresponding coloring sheets to fill in while I read aloud from our Louisiana Purchase book list (see below). We played a really fun Lewis & Clark Westward Bound board game. The cards relay information about the trip at each stop along the map. Lastly, I purchased a few pounds of white sculpty clay and the boys fashioned pieces for our Corps of Discovery diorama. I read aloud from a few books written from the experience of Seaman, the massive Newfoundland dog that accompanied Lewis and Clark on their journey. We baked the pieces in the oven and then painted them a few days later. This was a great project! I love how hands on it was. I also got a lot of reading in while they worked and afterwards, while they played. On Friday, we went for our usual nature walk. The boys had spent the week cataloging the plants in our backyard. We dissected a bird of paradise flower and labeled each part. 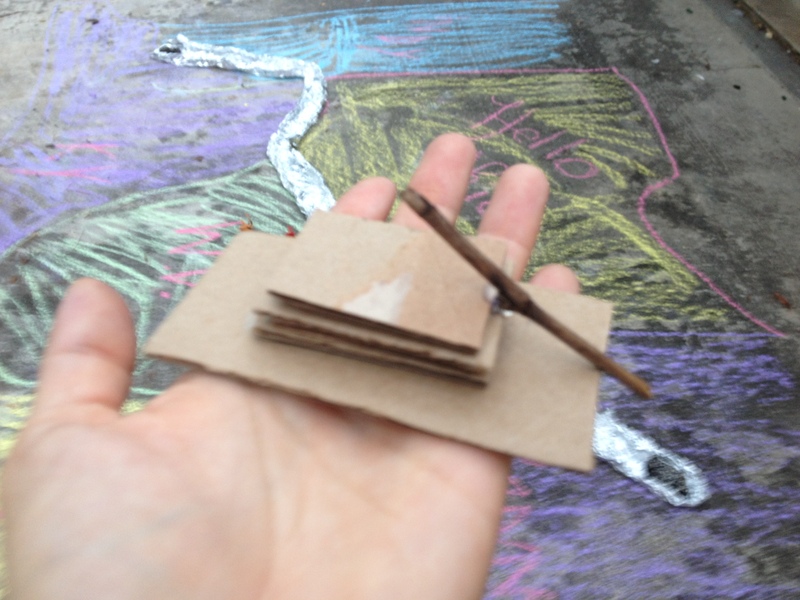 I had seen a great link for making your own grocery bag nature journals, a la Merriweather Lewis. I had planned to let the boys fill their homemade journals with drawings of native plants as though they were the original discoverers. In the end, I opted to just let them enjoy the great outdoors with a project in mind. When we returned home, they worked on their natural journals and sketched a large piece of brood comb from one of our pine trees. They also sketched a honey bee and labeled its parts. I’m glad we did this instead of the journal. They were much more excited to sketch bees today. Some days, its better to let them lead their own learning. We ended the week by playing one of our new favorite board games, Wildcraft, in honor of those crazy botanist/explorers Lewis & Clark. We’ll be taking the next week off and I plan to read “Of Courage Undaunted” by James Daughtery. This past week, I opened American Pioneers & Patriots and began reading the story of the O’Neill family heading down the Ohio River. The boys were decidedly not interested. I knew attention and participation would be an all day, uphill battle. I was not in the mood for that. So I took some cardboard and the hot glue gun and built a flatboat. Then, I asked the boys to bring out the aluminum foil. We walked to the driveway with a bucket of chalk. I sketched out the states surrounding the Ohio River. 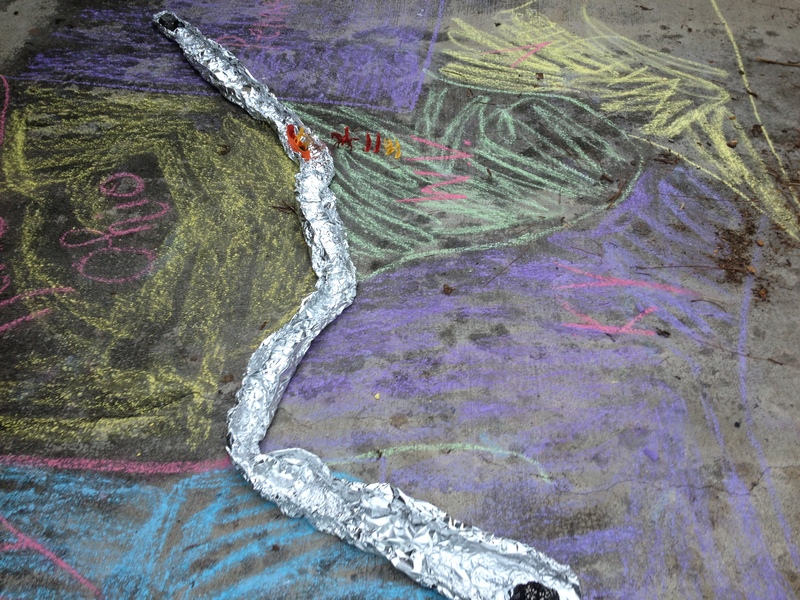 We set the foil out along the line of the river and curved the side up high. 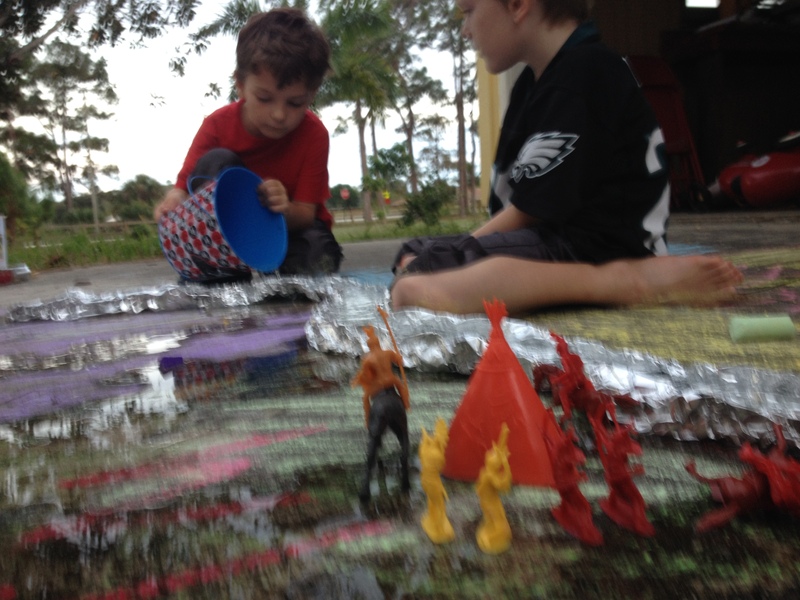 The eldest grabbed plastic teepees, warriors and canoes. The six year old held the raft and began gathering “supplies.” Little leaves, tiny berries, small stick to use as rifles. We poured water into the Ohio river and the cardboard raft achieved lift off. The boys were thrilled. As I read aloud from our book, they acted out each page. They asked thoughtful questions that sent me running to the computer for more information. They played with this set up for hours. Long after I had finished our assigned reading and the extra books in our basket, they played on. I sat in a green lawn chair and hummed through Over the Rhine’s Ohio album. 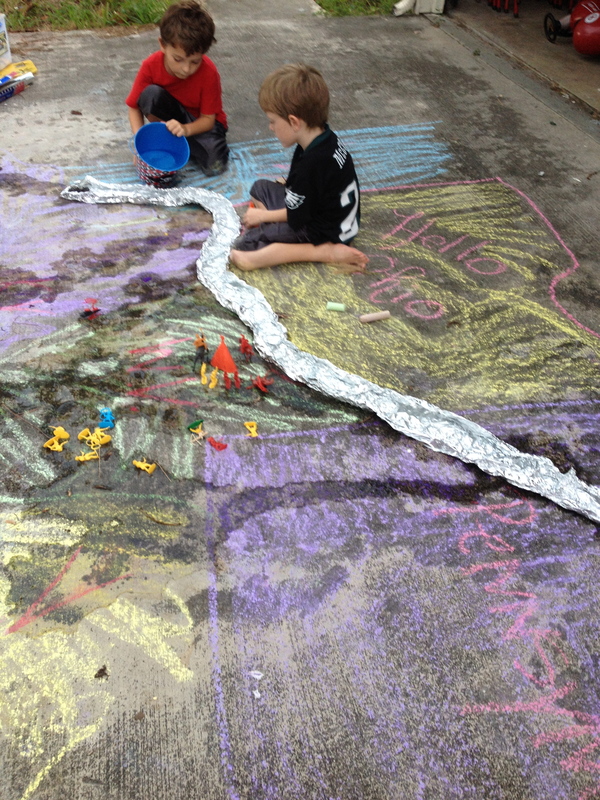 By the end of the day, the water had leaked out and washed away the chalk. The next day, the boys ran out of the house with a laminated map in hand. Together they determined where the boundaries of each states should be. They carefully reshaped the Ohio river and even thought to elevate one end with flat rocks to help the stream flow in the right direction. Its good to change the scenery sometimes. Its good to give their small hands something to do while they absorb information. 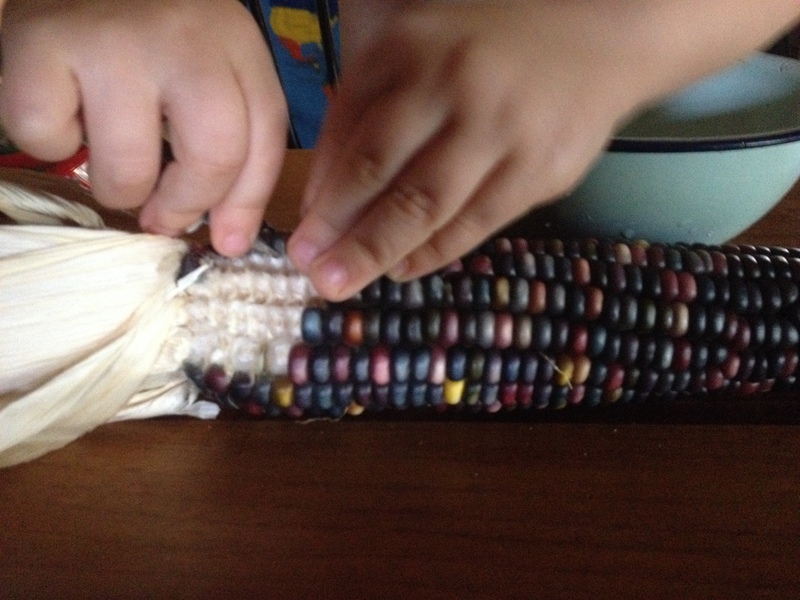 Before starting “On the Banks of Plum Creek,” I handed each boy a bowl, tweezers and an ear of Indian corn. They pried kernels loose while I read. We are collecting all these colorful kernels for our upcoming Thanksgiving unit. I love the concentration they exhibit during this exercise. The silence is also pretty fantastic. We read five or six books on Johnny Appleseed this week. Our whole week was infused with apples! I made apple dumplings for the boys to eat while I read aloud from Margaret Hodges book. We sliced apples in half and used them to stamp butcher paper. We carefully folded up our project and stored it away for next month, we’ll be using the long rolls of apple stamped paper to wrap up presents for family. My five year old collected dozens of apple seeds and we used them as counters for our math lessons. The boys learned a great deal about John Chapman’s character this week. I believe it is the first time they have ever truly considered the idea of legacy. They are starting to wonder if they could change the world around them, even in a small, yet still significant, way. I pulled out Miss Rumphius by Barbara Cooney. After reading about the transformation Miss Rumphius ignites in her neighborhood, I charged the boys to begin thinking of ways they could impact our neighborhood for Christ. I am looking forward to hearing what they come up with! We have been studying kingdoms and classifications in Classical Conversations this year. We used a few of our science worksheets and lab sheets to reinforce our MFW Science. The boys really enjoyed this exercise in particular. Animal Kingdom Notebook Printables helped flesh out our Animal Kingdom Classification Books. Divider pages for each different kingdom are provided. The boys filled in facts about each one and went through a pile of magazines and cut out animals for each category as an “end divider” for each kingdom. Now as we study various animals we encounter in stories, on nature walks, or in our curriculum, we can draw their picture, record facts and file them behind the appropriate kingdom. Team B enjoyed many fun projects and games throughout the week with their Year of Playing Skillfully curriculum. Team A joined in the fun! They still need heavy doses of play throughout their day. Pumpkin volcanoes and a Van Gogh study kept hands and minds engaged during breaks this week. 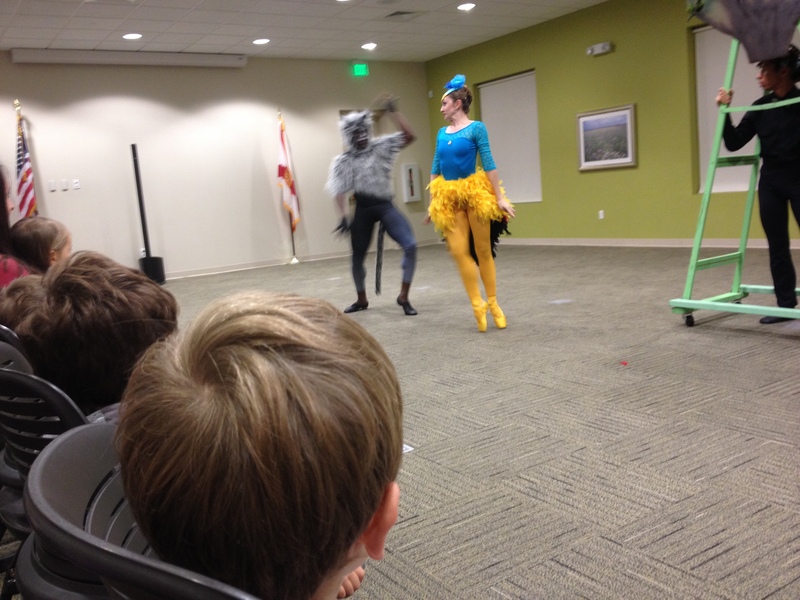 We also had the opportunity to watch a free performance of “Peter and the Wolf” at our local library. I was amazed at how much the boys remembered from their study last year during My Father’s World 1st grade. They called out the names of different instruments and characters and remembered the majority of the plot line. We are getting ready to study “The Nutcracker” in a few weeks. I have finished compiling all the assignments and we will complete the entire unit before attending the show! We can’t wait!